Hey, are you looking for some sweaters for men? Do you want it to go basic or trendy? To wear alone or to layer with other garments, like t-shirt for example? If you already clarify which one to go to and need some recommendations of good sweaters that are worth the money, this article will give you many models, picked from different brands, and price range to ensure at least one of them will match your demands. However, if you are still a new comer who have no idea of which to go for, or don’t know that type of sweater should style which garments for a good look, I also include some useful and practical advice here (from my own experience and others) to help you out. I think, the biggest reason you should spend time on this collection is all of the listed sweaters are from well-known and reliable brands with good warranty. Plus, their products are high-quality and versatile as well to be an essential in your wardrobe. From that point, without further ado, let’s get straight into it! When it comes to Amazon Essentials, I bet that many people will have the same thought as I used to – these pieces will be more about this Mr. Giant’s fame to take money from customers. But right after trying this V-neck sweater, I feel so sorry for that. It’s super high-quality, comfortable and durable. The sweater is made out of good cotton to leave nice hand-feel and it is totally skin-friendly, even if yours is sensitive. As made out of cotton, you can machine wash it as well – very convenient. 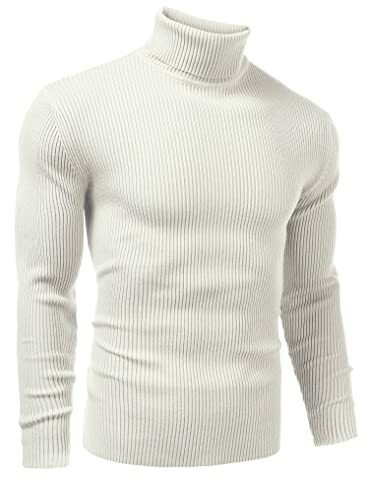 If you are a man with short neck, this is going to be your best companion for this winter due to its V-neck design. For those who don’t know, this feature is one of the must-remember things to help your neck look slimmer and higher. Two other things about this brand: they provide really various size chart and color options to ensure you can pick the most suitable for your body shape and favorite. Besides, their sleeves or the length isn’t short at all, fit nicely to mine. Most men usually style sweaters with shirts so, I highly recommend to going for one size larger than usual to get the best fit. 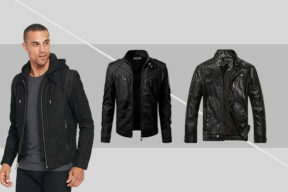 Due to its simple and elegant outer performance, you can totally dress up or dress down with it. If you are on a tight budget, this is really worth a try! 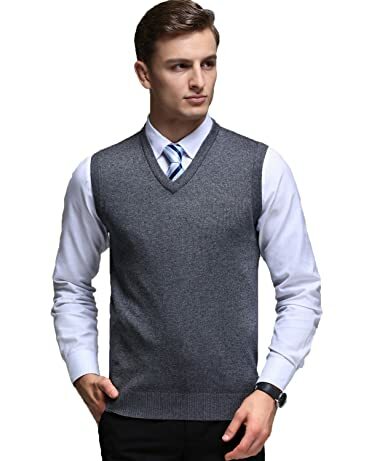 To build a perfectly successful businessman style in this winter, I highly recommend you to trying a v-neck sleeveless sweater vest – styling with a shirt and bowtie inside. Never wear it alone because its thickness and warmth aren’t enough to help you survive such cold days. Despite its great fabric texture, you have to admit that if you go for a bright color, it’s possible to see through the sweater. You can go for neutral or dark colors for an elegant look. Or, combining different pairs of color to emphasize your personal fashion taste. Don’t worry, this Kinlonsair comes in various options for you to go to, from colorways to sizes to ensure you can pick at least one for your body and style. Speaking of the material, it’s half of wool, 20% polyester and 30% acrylic to be lightweight and machine washable. Besides, it delivers amazingly soft hand-feel. Thus, combining with unique modern design, it’s sure to be a trendy item this winter. If you still have no idea of which pants to go with, my advice is casual pants or the stylish denim for a perfect daily look. 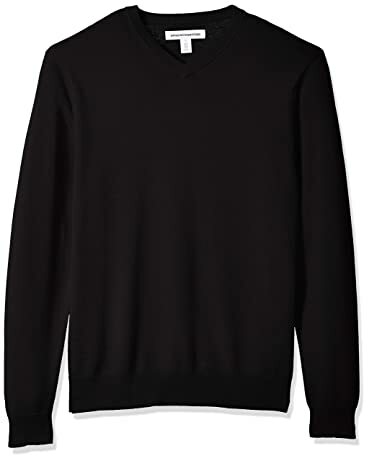 Unlike Amazon Essentials, this sweater comes in US size, which means you don’t have to consider hours to go for one size up or down. There’re just two things you should bear in mind with this garment: tumble dry low only and don’t bleach it. Yeokou is a great zippered sweater with extra ribbed cuffs, stand collar and hem. Plus, there are two slant deep functional pockets on both side where you can toss your hands there or some essential stuff like wallet, smartphone or money. 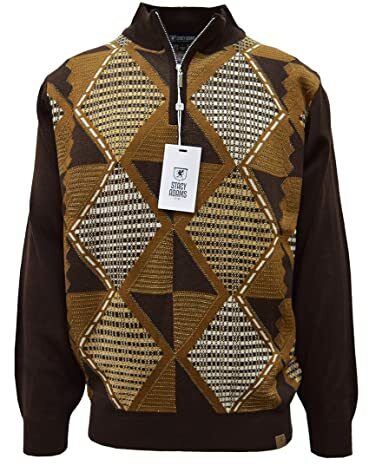 This is one of the trendiest mens sweaters at the current. Important, its material is a blend of cashmere, wool, cotton and anti-pilling fiber to not only give you comfortable warmth, but also some more functional taking advantage of each kind of fabric. And don’t worry, this thick men’s sweater is machine washable as well. From such that comfort and warmth, it’s perfect as a windbreaker outer coat for many seasons like winter, late autumn or early spring. Besides, its outer performance is quite stylish and cheek for many occasions like daily use, hanging out, shopping or things like that. Another great bonus is its plaid fleece lining consisting of arms so that you will feel truly cozy and comfortable in chill days. Last but not least, its size chart! If you have been tired of too-small or two large size chart that is wasteful and time-consuming, this US-size sweater won’t be a matter at all. just go for your size as usual, it surely fits your body as a glove. There’s one thing you should keep in mind after washing this garment – air dry it only. 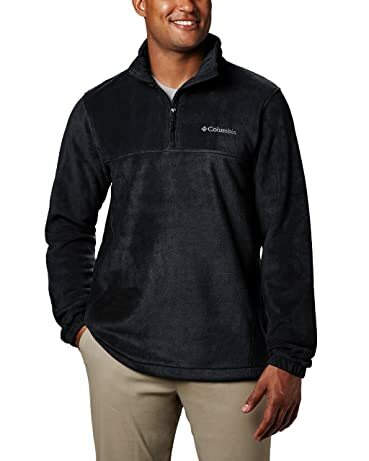 Differ from other Columbia’s garments which are quite heavy in logo, this half zip men’s sweater is more elegant and simpler than – perfect for those who love minimal yet exquisite designs. On the other hand, it’s far less expensive than other well-known brands yet Columbia is one of Mr. Giant in this field. From that point, for the money, you can rest assured to get a right product. Unlike other counterparts you have just seen in this collection, its material is 100% polyester for amazing lightness to be a packable item, good durability, machine-washable ability and soft texture. Truth to say, it’s like somebody is cuddling you when putting on this garment. Though lightweight and a bit thinner than other types of fabric, this Columbia still brings moderate warmth and closure thanks to its ribbed cuffs and stand collar design. But what I like the most is its hem with an adjustable drawcord that you can adjust it to fit your waist the most, unlike the ribbed hem like you usually see in other sweaters. Some of them might be too tight or too loose sometimes. Another great, great bonus is the two-side zippered pockets that not only you can place your hands there for warmth, but also hold your essentials safe and sound there. Besides, this product line comes in diverse color options to go to. Some are just plain color, while the others are a mixture of two contrasting ones. And one last thing, it’s true to sizes. 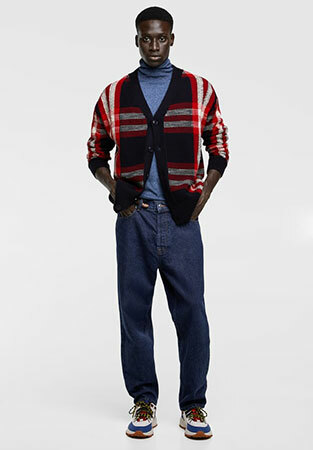 But, if you love layering this sweater with a shirt inside, go for one size up to get the best fit. 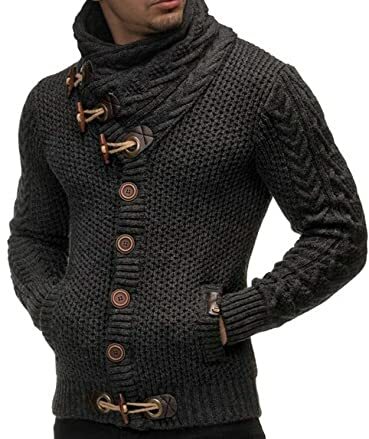 Have you fallen for this cool men’s cowl neck sweater yet? I personally love the style of this sweater so hard. It’s cable knit details in sleeves and collars are truly two big bonus to add a unique and on-point fashion to this garment. But what add more vintage look to it might lie in the large horn buttons embedded on the frontside, plus, a nicely slim fit silhouette to fit snugly to your body shape. This is a versatile item that you can wear as a mens sweater and cardigan at the same time. It’s super lightweight, yet warm to help you survive even in the chilliest days. As an extra function, its two closure pockets hold your vital stuffs pretty well such as cards, cash, a wallet or smartphone. Choose from various colorways: blue, black, grey, brown, red, and orange, I’m quite sure you will definitely pick at least one to add to your closet. Big and tall guys don’t worry, there is surely one right size for you. By the way, when purchasing, go for one size up to get a perfect fit. This Wrangler is perfect for layering with an elongated shirt inside for extra warm because though its premium polyester still makes me warm, it isn’t closure enough at the hems or cuffs to keep my hands, wrists and waist cozy. However, due to the non-ribbed design but just a closed half zippered collar, it brings a casual vibe with relaxed fit to dress down. Besides, it strikes back with an inner fleece on the backside for extra warmth to your back. Plus, there are stitching details and side vents to add more uniqueness to this design. Due to the high-quality polyester material, you can machine wash the garment to save your hands in this cold weather. If you own a droopy neckline, its higher neck design on all sides will conceal that weakness to dress you more sharply while ensure to zip down to not be annoying to his throat. Last but not least, the size chart is true, which means you just need to pick yours without spending hours to consider going one size up or down. Take note that it’s designed as a loose fit. So, for those who prefer slim fit to your body shape, let’s decrease one size down. Besides, thinking it as a surprising present for your male friend isn’t a bad idea at all. He will surely love it! 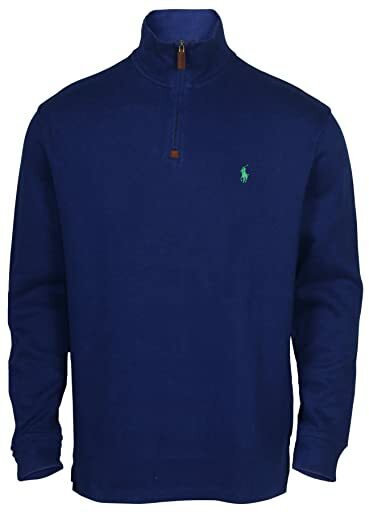 Polo is another well-known brand that isn’t too heavy in logo. They mark their brand with a small, elegant embroidered image on the frontside. And, it’s not an exception with this Palph Lauren sweater. Aside from that tiny brand logo, the whole garment is plain, simple and minimal. 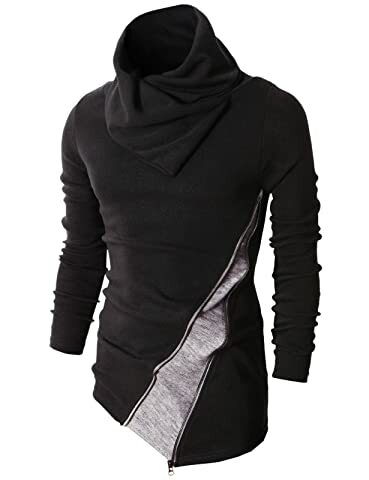 However, it fits nicely to anybody and also features a half zip closure to not only keep the neckline stand up when in need, but also provide extra closure to your neck area. Made out of cotton, however, compared to the Amazon Essentials’, I personally like the soft feeling touch of this Polo more. And, it’s understandable because Polo is featured as a mid-tier brand. The quality of this garment truly bangs for your bucks. Not only softness, it’s also machine washable as well to give more free time on your hands. Other than that, there is an avalanche of color options to choose from. Speaking of its size chart, it’s true to size. However, if you can’t identify which to go to, feel free to ask the manufacturer because their customer service is truly great. They will respond to you really soon. One last good news, it’s not shrinkable at all to hold the original shape to the end. Can’t deny the super-fast development of Korean fashion as well as their Influence to the world. H2H is a typical example. 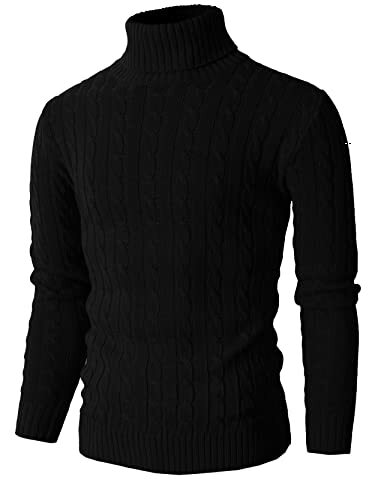 Their designs are truly on-point, unique and fashion, especially this casual slim-fit turtleneck sweater. There is a variety of colors to choose, but, take note that some style No. will come up with different design and pattern. For example, the #KMOSWL0235, #KMOSWL033, #KMOSWL250, and #KMOSWL244 are solid cable knitted, which is a perfect piece in your basic outfit in this winter. Or, you can style it with a colorful jacket or plaid pants. Meanwhile, some designs have snow patterned to style in Christmas or you can gift it to someone as a meaningful present this holiday. Whichever you go to, they are wearable, easy to mix and match and also, easy to fold and packable as a travel item. Overall, this pullover sweater is a perfect piece to add soul to your chic style to your office or off-duty looks. There are two things you should keep in mind about this garment: Firstly, you should hand wash it with cold water only to maintain its shape and secondly, as it’s Asian made, the size chart might be a little bit smaller than US standard’s. Besides, it features a slim fit silhouette so, I highly recommend you to going some size up for the best fit. From the very first time seeing this white turtleneck long sleeve slim-fit pullover sweater, I thought right away to an elegant, romantic gentleman style – matching with a shearling coat and brown pants. But, another thing that leaves stronger impression on me is its material – made out of 100% acrylic (like the H2H’s), this little bad boy is super soft and comfortable. Oh my God! The natural cotton texture is stretchable itself to give you the best fit while providing comfortable warmth to style in winter, fall or spring due to its thick knit trim. It’s versatile and fashionable. You can wear it alone or layer it with a shirt inside for those chill days. Besides, you can pair it up with almost of your outfits and styles, like jeans, slacks and suits in a lot of occasions and venues. Besides, it’s foldable and packable as well. Speaking of size, there are size for tall and large guys, which is a good news. It’s up to men’s XXL sweater. I have to take note you about its maintenance guideline because this one needs careful care: you should hand wash it only in maximum 40 degrees Celsius in temperature, air dry and if you want to iron it, use the press cloth. Zara is a well-known brand that you should not miss out this winter to collect some interesting, high-quality garments, especially sweaters. I love this perl knit design for its beautiful burnt orange color which will be a staple of my outfit and easily make it stand out from the crowd. If you want to emphasize your style or a spotlight of any parties, go for nice plain pants with contrasting color like yellow or navy blue. Or, striped or plaid pants aren’t a bad idea at all. About the material, this sweater is made out of 100% premium cotton for superbly soft texture. It’s totally skin-friendly and you are sure to feel a difference from other fast fashion sweaters. Besides, it’s warm, really warm to help you survive those super cold days without need of layering. I think it’s also partly thankful for the ribbed elastic trim on hem, cuffs and collar to keep your natural heat inside better as well as prevent cold air from the outside. Good news is you can machine wash this garment, but take note that only wash it in 30 degrees Celsius as maximum temperature to maintain its shape, using gentle cycle. Besides, no bleach, no dry clean and no tumble dry. Next is this knit checkered sweater jacket from Zara. Might you already know it or not, checkered pattern is still a hot trend this season, which is the major reason I add this cool, masculine and unique jacket to this collection. It’s perfect to style with a sweater, shirt or t-shirt inside, giving an outstanding casual vibe to your off-duty or office looks. This straight cut knit sweater jacket is made out of a blend of acrylic and cotton to deliver lightness, warmth and soft feeling touch. It also requires less maintenance rather than other kinds of material – machine wash with gentle cycle in maximum 30 degree Celsius, ironable in maximum 110 degrees Celsius. However, like the perl knit sweater above, don’t bleach, tumble dry or dry wash it. Three sizes to choose from: M, L and XL. Plus, it’s US size standard so that you don’t have to consider whether going one size up or down like other sweaters. Besides, it has many available store to check in and try directly before picking the most suitable one. For quality and design, I really highly recommend this item. This Stacy Adam men’s sweater is one of my addicted sweaters for its cool striped pattern on the outside. Look! You will receive a bunch of compliments any time going into a room and surely, there will be a good conversation starter as well. Aside from the second-to-none pattern, its shape is stylish and closure as well with ribbed cuffs and hem combining with polo collar. This sweater features loose fit to bring an impressive, cool casual look. Ideal to style with plain pants, jeans or khaki. You can wear it alone or layer with other garments, depending on your preference. Overall, this is a must-try garment to take into consideration. Speaking of sweaters, it would be a big mistake if not mentioning to Patagonia. This is a high-end brand specialized in streetstyle garments. And for its price range, the quality is truly only. 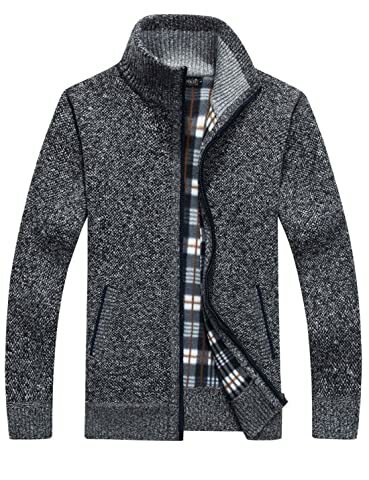 Like this men’s sweater jacket, it’s made out of 100% premium polyester while the cuffs, bottom hem and back of neck is shape-holding micro-polyester jersey for good abrasion resistance, lightness and soft feeling touch. Due to its high-quality material, you can absolutely machine wash it. Despite its thinness and lightness, thanks to its inner fleece which provides extra warmth to keep you comfortable in chilly days. Another compliment is for its raglan sleeves and pack-wearing design for great mobility and comfort. Besides, there are two zippered pockets on both sides to keep your hands warm or your essentials like money, cards, wallet, smartphone or stuff like that. But what I like the most is its chest zip-up pocket on the frontside which is ideal for more stuff. But, I highly recommend for flat and thin objects like documents, papers or cash. One thing that I love the most about Patagonia is their elegant and not too heavy in logo. You can see that this sweater is quite simple and plain with small brand logo on the left chest area. 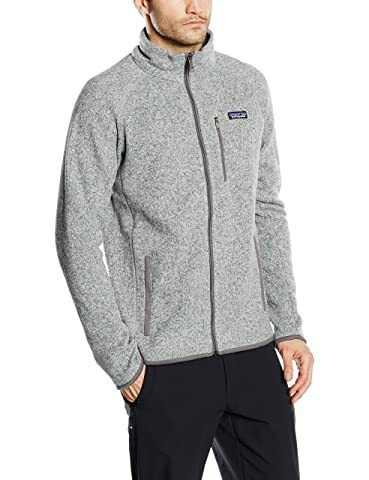 Moreover, compared to other straight fleece, this sweater is better wind resistant due to its neck and wrist collar to keep wind from sipping inside. Particularly, it will not shrink even you dry it from low to medium setting. 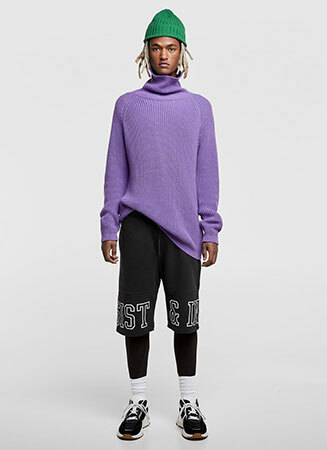 Like the previous H2H sweater mentioned above, this Korean-made design featured as a pullover turtleneck that is made out of 100% high-quality polyester. But the biggest difference here is its top design – which is the cowl neck to add more stylish, chic and sleek vibe to your outfit. However, it doesn’t lose its versatility. You can style it with many pieces like jeans, trousers, pants, plaid pants, t-shirt and more, from Hip Hop, party to casual. It’s up to you and what kind of fashion type you are in. But, believe me, it will draw the surrounding eyes and maybe, somebody will ask you where to buy it. It’s highly recommended to hand washed, but if you are a busy guy, washing this garment by machine is okay, just remember to choose the gentle cycle and air dry only to maintain its shape. As it’s Asia-made, you should keep in mind the size chart which might be a little bit smaller than the US’s. Mine is going true size because I like to get slim fit shape and after several washes and laid flat to air dry, it doesn’t shrink or discolor at all. However, if you are still afraid of shrinkage, go for one size up for safety. If you are looking for the best sweater for men with regular fit, this is going to be your best bet. It’s Adidas Men’s Soccer Core18 Sweat Top, made out of 30% polyester and 70% cotton with great breathability and comfort to keep you warm and pleased all day long. Thanks to polyester, the weight of this sweater is much lighter than the 100% cotton. Besides, it wicks moisture away quite quickly and dry fast as well. Believe it or not, after washing by either machine or hands, just laid it in a flat surface, this little bad boy can dry complete within a couple of hours without needs of dryer or sunlight. I also like its outer performance as well. it’s quite simple with a single black stripe along the sleeve and a small, elegant brand logo on the frontside. Speaking of its warmth and closure ability, I confidently rate it the highest score. It’s because not only the high-quality winter material, but also the added ribbed cuffs, bottom hems and the collar. You can wear it along or layer with other garments due to personal preference. But it’s essential to style with a scarf for the best coverage and warmth to your neck. Besides, five colorways to choose from. These are 15 best sweaters for men (both in quality and fashion spectrum) that I highly recommend you to try, at least one of them will suit for your favorite, demands, requirements and budget. But before clicking that “Buy” button, I hope you can figure out which garments you are going to style with it to avoid wasting your money. Besides, consider to choosing the right size fitting your body shape the most. All of these 15 models are what I really hope you will try. I believe that you can style so cool with it, due to its versatility and my advice.